For those interested in even more robust energy savings in the realm of 80-90% over a conventionally built baseline home, we are also certified to offer passive house construction, one of the most rigorous energy-efficient construction standards available. Developed in Europe in the 1990’s, ‘passivehaus’ or passive house construction for buildings and homes is a proven, well-established technology in Europe where there are approximately 30,000 buildings and homes realizing these highest levels of energy savings. When you add-up the significant energy savings and the superior livability of the passive house, it’s a compelling combination that offers tremendous value to homeowners. Before we talk about what a passive house is, let’s start with what it’s not. When many people hear the term, ‘passive house’, they think it must be a house with solar panels or a home warmed primarily by the sun. To keep things simple, consider that a passive house ≠ a solar house. So, what is it? 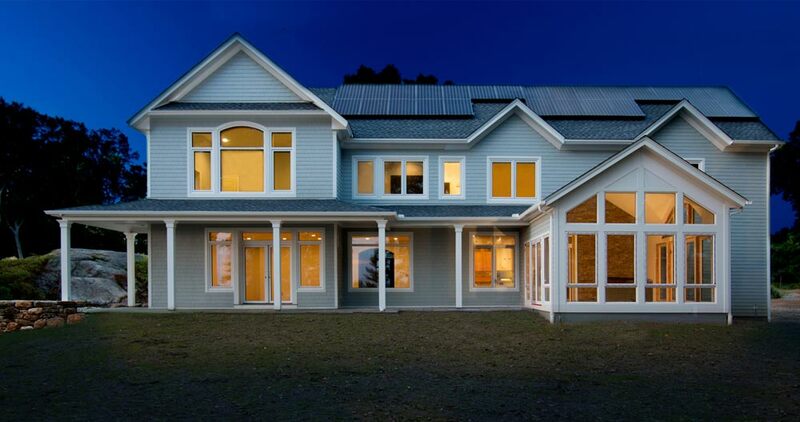 Hallmarks of the passive house incorporate many of the principle elements mentioned in regard to a ‘Whole Home as a System,’ but with the additional rigor of a mathematically precise airtight thermal-bridge-free construction technique, beginning with the orientation of the home on the building lot, intentional shading accomplished through design elements such as awnings, and strategic placement of ultra-high efficiency triple-pane windows to take advantage of seasonal daylight to warm the home in the colder months and cool the home in the hotter months. 1. Extremely Well Insulated – Around all exterior surfaces, including below ground. 3. Thermal Bridge Free Construction – Stops the transfer of heat and cold in the wall assemblies by breaking the thermal bridge. An easy way to understand this is that the cold air in winter (that you might feel on a window) is stopped from coming into the home and hot air or heat is stopped from transferring out of the house. 4. Mechanical Ventilation – Accomplished by a constant supply of fresh, filtered outside air that is brought into the home while the stale air is blown out. Furthermore, the system is designed specifically to supply fresh air into primary living spaces such as living room and bedrooms and draw air out of spaces with higher odor and moisture content: kitchens and baths. Brilliant! 5. High Performance Triple Pane Windows with Low E Glazing – The triple glass contributes to breaking thermal bridges, prevents massive heat losses and contributes to achieving passive solar gains. 6. Passive Solar Gains – To maximize passive solar gain, or harness the sun’s energy for heating and minimize its effect during warmer seasons, more windows are placed on the south side of a Passive House and less windows on the side with northern exposure. Additionally, to avoid overheating in the summer, passive houses also feature intentional shading (awnings, etc.) as needed for southern exposures. Because of these elements, all working together as system, the actual requirement for heating/cooling a passive house – or the size/capacity of the HVAC unit, is quite minimal compared to those required by traditionally-constructed homes. Besides being carefully designed and built for ultimate energy efficiency, a Passive House offers superior comfort. Superior Indoor Air Quality – Due to a continuous supply of filtered, fresh air, the overall air quality is healthier, with less pollen, and dust-free. Also, due to mechanical ventilation, the air in a Passive House never gets stale or stuffy as it does in a typical home when the windows are left unopened. Consistent Indoor Temperature – Due to all of the combined elements listed above, a pleasant temperature is consistently maintained in living spaces without the help of either a conventional heating or cooling system. Passive homes are free of hot or cold spots and free of drafts, especially close to common trouble spots near exterior walls, windows and doors. Windows, floors and all interior walls stay the same pleasant temperature year round. Quieter Living Spaces – Because passive homes are virtually air tight and extremely well insulated, the transfer of noise is minimized which means that ambient noise levels are kept at pleasant levels. In sum, in all the years we have been engaged in energy-efficient construction, the Passive House building standard excites us the most because of all the amazing benefits it affords, and we couldn’t be more thrilled to be able to share and provide this building construction standard as an option for our clients.